The OPPO Find 9 is one of the major phones we expecting from the brand in the month of June. The rumors keep dropping in every day while today there has been a major news that the new phone could feature a 4K display. Something that we had seen from Sony earlier last year when they had launched the Xperia Z5 Premium with a 4K display panel. The display of 2K resolution is something that’s the highest we would need because anything above that is an overkill, while few brands are still trying to push this harder to the next levels. Few months back there were already rumors that this phone could come with Qualcomm Snapdragon Sense ID, but today the news points towards larger camera sensors on the same. There is a 21 MP rear camera that’s an industry standard but also a surprisingly 16 MP front camera for those selfie lovers. The phone is going to be powered with the Snapdragon 820 chipset along a 6GB of RAM variant too that comes with a 128 GB of storage. As you can notice in the above image there are two variants expected, though there are rumors that the larger storage variant would be made available only in China. Reportedly the price could start from 3998 yuan that roughly translates to $ 615. 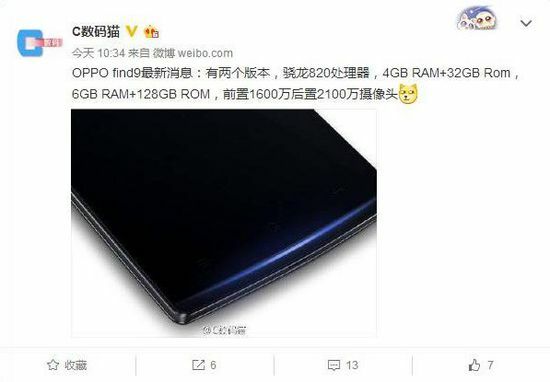 We will keep you posted on any other news we find around this phone but as of now this is the only information available, but based on these specs it can be clearly guessed that this is the flagship device from OPPO for 2016.